Morrigan Crow is cursed. Born on an unlucky day, she is blamed for all local misfortunes, from hailstorms to heart attacks, and, worst of all, the curse means that Morrigan is doomed to die at midnight on Eventide. But as Morrigan awaits her fate, a strange and remarkable man named Jupiter North appears. Chased by black smoke hounds and shadowy hunters on horseback, he whisks her away into the safety of a secret, magical city called Nevermoor. It's there that Morrigan discovers Jupiter has chosen her to contend for a place in the city's most prestigious organisation, the Wundrous Society. In order to join, she must compete in four difficult and dangerous trials against hundreds of other children, each boasting an extraordinary talent that sets them apart. Except for Morrigan, who doesn't seem to have any special talent at all. To stay in the safety of Nevermoor for good, Morrigan will need to find a way to pass the tests. or she'll have to leave the city to confront her deadly fate. Miss Morrigan Crow, daughter of the illustrious Chancellor Corvus Crow will not be mourned as she passes for she has brought misfortune and calamity to the shire of Jackalfax. Morrogan Crow is a catastrophic young lady that has been condemned as unfortunate, spreading hullabaloo and pandemonium throughout the community. On the eve of the Sixteenth Age of the Wintersea Republic, Morrigan receives an intriguing invitation extended by Jupiter North and The Wundrous Society. Her survival and Nevermoor awaits. 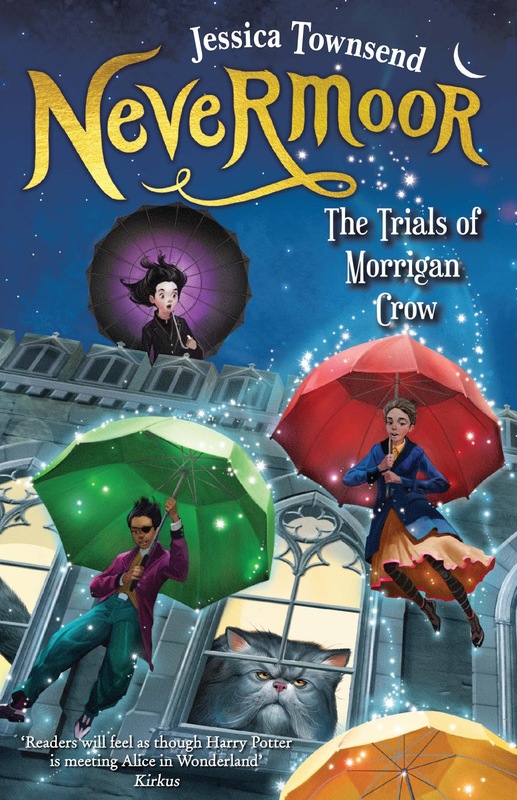 The Trials of Morrigan Crow is a fantastical, wondrous and whimsical adventure. Eleven year old Morrigan Crow is an unfortunate child and the origin of mayhem who will come to pass on the eve of Eventide. Morrigan is a wonderful young lady, intelligent and whimsical although resignated to accept responsibility for Jackalfax's outrageous predicaments. On the even of Eventide, Jupiter North offers Morrigan salvation, accompany him to Nevermoor to compete in the Wundrous Society tournament. Morrigan is sceptical but intrigued nevertheless and steps boldly into the enchanted world. Throughout the narration, we discover Morrigan is a young woman who has never known a sense of belonging. Her father has remained cold and distant while the citizens of Jackalfax believe Morrigan to be a blight upon their community. In Nevermoor, Morrigan is considered to have entered illegally and the authorities are determined to send her home. Jupiter North is a mysterious, bearded man and a member of the prestigious Wundrous Society. Jupiter is the proprietor of the distinguished Hotel Deucalion, a debutante Patron and Morrigan's guardian. A remarkably diligent man, Jupiter is an integral aspect of Nevermoor and often called abroad on official business. The Hotel Deucalion is home to a wonderfully, eclectic assortment of characters. Fenestra the talking Magnificat, Jack the sullen nephew of Jupiter and a vampire dwarf throughout the wondrous and fantastical floors, the smoking room with scented vapour to ignite the senses, the hall of shadows where imagination will run amok. Competitor and friend Hawthorne is a delight. He and Morrigan become inseparable friends and a tremendous support throughout the competition. The Wundrous Society tournament consists of four stages to assess the children of Nevermoor. Shenanigans are inevitable with hundreds of competitors in contention, deception and terribly treacherous children determined to be victorious. Darkness descends over Nevermoor when the villainous and unpleasant Wundersmith inconceivably is causing pandemonium. Despite being banished. The Trials of Morrigan Crow is whimsical and atmospheric, the epitome of fantastical and imaginative fairytales. Delightfully written and a breathtaking debut from author a Jessica Townsend. This sounds like such a fun read! I'm LOVING the cover; seriously, it's gorgeous. I like that it has such an intriguing cast of secondary characters too. Characters are often one of my most favorite things about a book. Thanks for sharing about this one - it's the first time I'm hearing of it! It's absolutely brilliant Lauren, atmospheric and enchanting. I'm so excited for the next instalment in the series. Oh my gosh this looks adorable! The cover screams FUN! And your reviews got me thinking I'd really enjoy the story :-) Another one to add to my TBR list! And it's only $12.50 on Booktopia for a signed edition at the moment too Sarah. If you go through Booko, also free shipping. It's absolutely brilliant. Like Lauren said above, this sounds like utter, amazing fun! Just reading this review made me smile, I can well imagine how much fun reading it must've been! It's such a fantastical, joyful read Verushka. A book that I'll be recommending to everyone. We could all use a little magic in our lives. I'd love to see what you think of it too Vanessa! Poor Morrigan, she is so unlucky! This sounds like such a cute Middle Grade. I so want it now! It's wonderful Sarah, such a refreshing read and so, so lovely. It's definitely one that will appeal to a wider reading audience, especially readers that love fantastical storylines and adventure. It was breathtaking! so is she really unlucky or she decided that she is because of bad things happening around her? Well you'll have to read it and find out Ailyn. Sneaky, sneaky. This sounds wonderful and I always adore mid-grade covers. So whimsical! The storyline is brilliant Karen, so entertaining and adventurous. I hadn't noticed before you mentioned it Topaz but I have! This one is magnificent though, such an incredibly fun and enchanting read. Reminiscent of the childlike joy that is Alice in Wonderland.